AUF in organizing the first SDIC as follows. * Schedule : 17 December - Arrival & Registration. 18-19 December - Lecture in Class room, from 9am to 6pm. * Venue : Hotel in Seoul, Korea. * Participants : From 3-5 Asian member countries, total about 10-15 participants. * Minimum requirement : CMAS 3 star diver or higher, Specialist on Marine Science. * Accomodation : EUR 95.- per night per room (same for single or double room). No food include. * Entry : Latest End of October for Hotel booking. 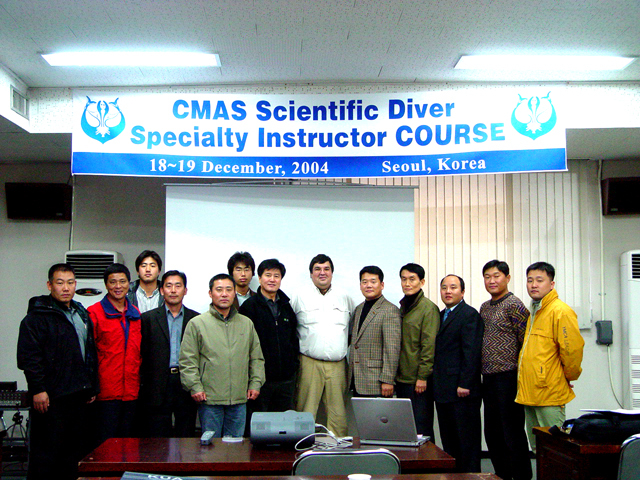 * Instructor : Dr. A. Norro - General Secretary of CMAS Sientific Committee.